Dell today introduced the XPS 15z laptop, the thinnest 15-inch PC on the planet, and the first in a series of new thin and ultra-powerful products from Dell to come this year. With the XPS 15z, everyone from mobile warriors to students and small-business owners now have everything they need to work hard and play hard in one stunning package. A leading-edge combination of uncompromising power and stunning design, the XPS 15z offers 2nd-generation Intel Core i5 and Core i7 processors, optional 15.6-inch Full HD (1080p) display for superior entertainment and web-browsing experiences, a backlit keyboard with adjustable brightness and up to eight hours of battery life1 – all housed in a luxurious, eye-catching and elegantly crafted case that is less than an inch thick. A technology package perfect for pumping out spectacular, media-rich office presentations or watching the latest award-winning movies, the XPS 15z includes 2nd generation Intel Core i5 or i7 processors, a brilliant 15.6-inch WLED display with a Full HD option that has almost two times the HD resolution of standard HD displays, NVIDIA graphics with 3DTV play capabilities2 , built-in WiFi, Bluetooth 3.0, USB 3.0 and a backlit keyboard. Advanced wireless features make XPS 15z your go-to device from the road or the living room. Built-in Bluetooth and WiFi connectivity ensure it’s fast and easy to connect with e-mail, websites, Skype and Facebook from almost anywhere. For at-home entertainment, the optional Intel Wireless Display** feature enables videos and photos to be streamed wirelessly from your XPS 15z to an HDMI-equipped TV. 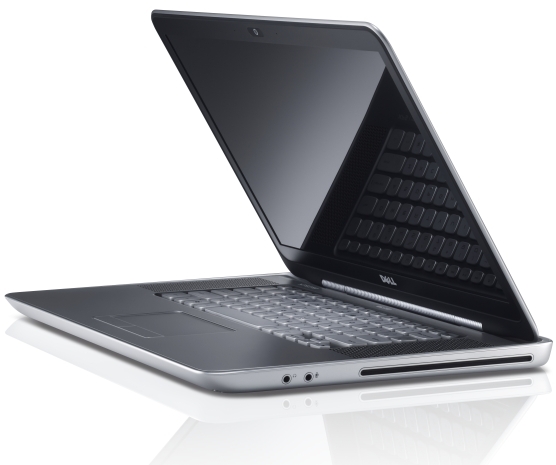 And with the exclusive Dell Stage user interface, it’s easy to access personal content such as music, photos and videos. The XPS 15z is available today from Dell’s global online stores, including www.dell.com in the United States, with retail availability to follow shortly.